CURIOUS ABOUT FOOD SUBSCRIPTION BOXES? Food subscription services are making meal prep a lot more modern. Have you wondered about services like Blue Apron and Plated? We've got the scoop! Ready to cook like Martha Stewart? Martha & Marley Spoon offer seasonal ingredients, pre-portioned for fast and easy meal prep. Ingredients are delivered to the subscriber’s doorstep in a chilled box that includes ingredients and recipe cards. The recipe cards provide instructions and clear photos that help make the prep less of a guessing game. Martha & Marley Spoon pull meals from over 18,000 recipes in the Martha Stewart archive, ensuring variety and creativity on the 10-meal menu each week. Customers may enjoy a tomato and pesto tortelloni bake, pork bulgogi lettuce wraps or roasted veggie white pizza. Vegetarian options are always available. No shopping, no chopping and no cleanup necessary. Freshly delivers chef-prepared meals fresh to subscribers’ doors. Freshly meals don’t include refined sugar, gluten or any artificial ingredients, and they’re never frozen. Vegetarian options are available weekly. Consider this service to be “gourmet takeout”. Subscribers simply select desired meals from more than 30 weekly gluten-free menu options. Freshly preps, cooks and delivers the meal to the front door. All that’s left for customers to do is heat the meal and enjoy. Prep time is estimated at two minutes, so put that microwave to work! Blue Apron is known for having top food quality and variety while remaining incredibly affordable. What makes Blue Apron unique is that they allow subscribers to substitute their protein: users may choose chicken instead of seafood or make the meal vegetarian. The main idea with Blue Apron is the ability to customize meal options. Subscribers can leave it up to the chefs at Blue Apron to choose their meals, or they can swap the meals for items on other menus. Weekly subscriptions are available, but users can also adjust their plan to receive three meals per week for one, two or even six people. Here’s a food subscription without the commitment. Users can pick their favorite meals from nine possible meal options Plated offers, then pay per plate. When a customer selects a meal or meals, the recipe and ingredients are delivered to their home, and the question of “what’s for dinner?” is answered with a knock on the front door. Plated’s menu changes weekly and seasonally, but the menu options always include meat, poultry and seafood from trusted purveyors, as well as options catering to vegetarian, gluten-free, low-calorie and low carb needs. Popular meals reoccur on the menu often, such as the crispy mushroom burger or Indian butter chicken. Whether users are looking for gluten-free, organic, vegetarian or paleo options, Green Chef makes it happen. This service is excellent for subscribers looking to satisfy food allergies or special dietary restrictions. Users select a plan that caters to their dietary wants and needs, and Green Chef delivers ingredients and easy-to-follow recipes guaranteeing meal-prep time right around 30 minutes. The Keto Plan features low carb, high-quality flavors, and is the fastest growing menu. The plant-based Vegan Plan is innovative and natural, while the Pescatarian, Omnivore and Carnivore Plans are all customized and delicious. Saving time is one thing, but saving money is another huge factor for many home cooks. Dinnerly is by far one of the most affordable meal kit services offered online. Meals are under $5 per adult-sized serving. How does Dinnerly do it? For subscribers with very specific dietary routines and restrictions, Home Chef is a great option. This service provides 13 weekly meal options, which include sirloin steak with blue cheese compound butter, teriyaki ginger-glazed salmon, chicken Caprese grain bowl, and vegetarian tofu chorizo tacos. Home Chef users enjoy the simplicity and joy of cooking. 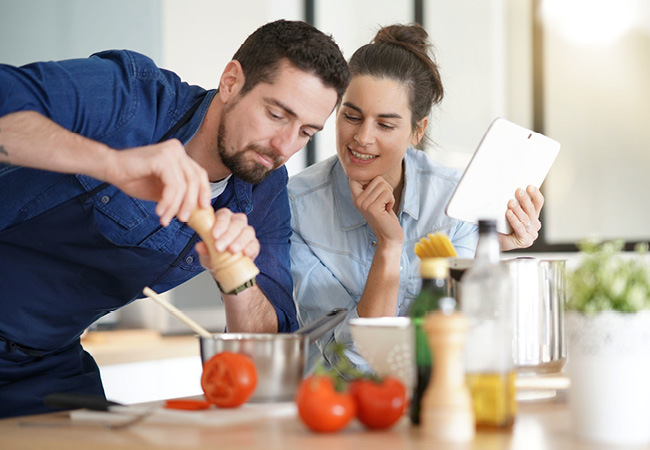 On the Home Chef website, users can identify which meals cater to their needs, and frequent allergens are clearly labeled, such as milk, fish, wheat or soy. The subscription can easily be controlled by skipping weeks or pausing the account. $9.80 for the “veggie” box (per person, per meal). Meals at HelloFresh are initially prepared and approved by professional chefs and nutritionists: health is just as important as taste, but efficiency is not forgotten. Once ingredients are delivered to the front door, meal prep time is only about 30 minutes, and ordering the meals can be done on their website or on the HelloFresh app. Subscribers can choose from the “classic” or “veggie” boxes and select three of five meals they want delivered from the menu on a weekly basis. In a meal subscription comparison, users found that HelloFresh meals offer larger portions of food, meaning subscribers were getting more for their money and leftovers for the days following the order.